For a ceremony that unironically asks people to refer to it as “music’s biggest night,” this year’s Grammy Awards sure felt like a referendum on its own place in the business. For years we tossed the Recording Academy the keys to the kingdom of music-industry prestige, and frankly, they did whatever they wanted, getting as much right as they did glaringly wrong. In 1973 America beat the Eagles for Best New Artist. In 1989, Jethro Tull beat Metallica to the inaugural Best Hard Rock/Heavy Metal Performance award, a move that upset fans so badly it was split in two the next year. Jimi Hendrix and Bob Marley never won Grammys. Taylor Swift has taken home Album of the Year twice. The last five years have seen an uptick in pushback between artists, fans, and the Academy with regard to representation for artists of color, who had begun to feel squeezed out of both cross-genre categories like Album, Record, and Song of the Year, as well as genre-specific ones. In 2014, Macklemore and Ryan Lewis’s The Heist swept all of the rap categories when many felt Kendrick Lamar’s critically revered good kid, m.A.A.d city deserved the merit, sparking an awkward, public exchange between both rappers and a dialogue about the stewardship of the show that seemed to lead to better balance the next year (Taylor’s 1989 Album of the Year victory over Kendrick’s inarguably superior To Pimp a Butterfly notwithstanding). Lately, the Grammys’ most vocal critic has been Kanye West. West criticized last year’s show with a withering string of tweets full of earnest concern (“I think the Grammys are important!! !” “Neil please reach out as soon as possible so we can make the Grammys culturally relevant again”) to withering disapproval. News that Kanye would be skipping the show this year despite multiple nominations for last winter’s The Life of Pablo suggested that his input wasn’t heeded. West’s absence, taken with Frank Ocean’s refusal to submit his music for awards and the no-shows of Album of the Year nominees Drake and Justin Bieber, felt like a vote of no confidence that, as the night unfurled, would prove prescient. The Grammys made do with the remaining talent in strange ways. Puzzlingly, this meant doubling up star power on nearly all of the performances, forcing big-deal Grammy Moments that collapsed under the weight of their expectations when they weren’t confounding viewers with the randomness. Country singer Kelsea Ballerini and Danish soul act Lukas Graham performed a mash-up of their singles “Peter Pan” and “7 Years” that ended in singer Lukas Forchhammer overpowering the plaintive Ballerini, even though hers was the better song. Later, Alicia Keys was brought out during country newcomer Maren Morris’s “My Church,” where she ran up intensity and pitch problems in equal measure. The best mash-up was the weirdest: Lady Gaga joined Metallica on their recent “Moth to Flame” and killed it, although problems with James Hetfield’s mic left him upset enough to throw his guitar across the stage to a tech as he left the stage. Just as quirky as the mash-ups were the tribute performances. Bruno Mars and the Time served Prince well, but not everyone had so firm a grasp on their source material. An all-star tribute to the Bee Gees turned into a wail-off between Demi Lovato and Tori Kelly, before the performance was brought back to earth by Little Big Town, a vocal group that understands the legendary Gibb brothers’ disco and AOR pop underpinnings despite working primarily within the confines of country music. Adele led a George Michael tribute with a shockingly dour reading of his bubbly 1996 single “Fastlove” that she restarted partway through, fearing a repeat of last year’s technical difficulties. The reboot didn’t lift the mood or shake the inappropriateness of playing a song so clearly about the joys of free love and gay cruising like a plodding tearjerker. Crowning Adele would turn out to be the theme of the night, as she swept Record, Song, and Album of the Year, among others. But her performance of “Fastlove” and the unimaginatively staged show-opening trip through the ages-old “Hello” offered proof that she’s a bit of a bore as a pop star in 2017 while revealing her as catnip for an Academy membership that seems to run more musically conservative than the general public. 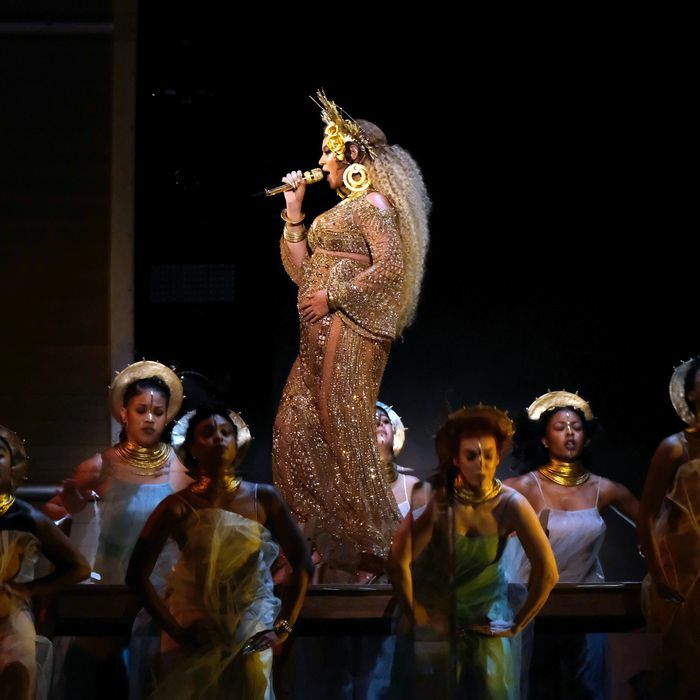 Beyoncé, on the other hand, arrived very pregnant and took the show by siege with a ten-minute arrangement of poetry, special effects, back-up dancers, and Lemonade ballads that solidified her guiding hand in the new ways people absorb event pop albums … only to get shut out of all the major categories. Adele herself could barely stand to accept the Album of the Year nod over Lemonade, and sobbed through her speech while Beyoncé cried gracefully in the front row, having lost in all the music categories she was nominated in but one, in spite of producing one of the year’s most indelible cultural artifacts. The fallout trickled downward: The attempt both to placate Bey’s audience with an R&B category win while spreading accolades between Drake, Solange, Maxwell, and others ultimately meant shutting out Kanye, Rihanna, and Anderson .Paak. Rap and R&B fans won’t be the only angry ones today: talk to a country fan about outsiders Pentatonix winning Best Country Duo/Group Performance or any of the dozen rock fandoms shut out by the corrective, posthumous near-sweep of the rock and alternative categories pulled by David Bowie’s genius Blackstar after over 30 years of the Academy stiffing the living legend on music awards. See, the better your genre gets in a year, the more of a bloodbath the Grammys become. The excellence of one album can come at a cost to peers, although sometimes a sweep is well deserved. Chance the Rapper is an example of the Grammys bending with the times and getting something very right; after successfully petitioning the Academy to kill the for-sale clause in the Grammy eligibility rule book, he took home three awards for the still-free Coloring Book and thanked mixtape maestro DJ Drama for his service to the medium. In a perfect world this opens up an avenue for further acclaim for mixtapes, although it would be foolhardy to expect an Academy that awarded Drake Best Rap Song and Best Rap/Sung Performance for “Hotline Bling,” a song that doesn’t contain any raps, to get it more than they do now. Chance’s Best New Artist windfall was heartening, but the nagging sense that a landmark year for black music couldn’t pull cross-genre wins past it recalls a remark Kanye made at a Grammy post-show event the last time Beyoncé lost out on Album of the Year, when Beck’s passable Morning Phase beat out the vastly superior Beyoncé in 2015: “At this point we tired of it, because what happens is when you keep on diminishing art and not respecting the craft and smacking people in the face after they deliver monumental feats in music, you’re disrespectful to inspiration.” In a recent back-and-forth with Grammy producers who insulted his 2013 ceremony performance, Frank Ocean was more pointed: “Use the old gramophone to actually listen, bro, I’m one of the best alive. And if you’re up for a discussion about the cultural bias and general nerve damage the show you produce suffers from then I’m all for it.” Minutes after the show was over, Solange tweeted Frank’s Grammy rebuke in solidarity. Where do we go from here? Back to basics. 1989 was the first year a rap artist was awarded a Grammy, but true to form, the show asked for more than it intended to give. The Academy wanted hip-hop to be a part of the show but had no intention of airing the presentation of its inaugural hip-hop award. In response, a group of rap’s biggest artists at the time — including Will Smith, who won the award as one half of DJ Jazzy Jeff and the Fresh Prince, Public Enemy, Salt-n-Pepa, and more — announced they were skipping the show. “You go to school for 12 years,” Smith said allegorically, “they give you your diploma, and they deny you that walk down the aisle.” In 2017, hip-hop gets to walk the aisle, but there aren’t enough diplomas. Perhaps it’s time for a bigger walkout.